Ernst Walter Mayr, more commonly known as Ernst Mayr, was a German-born American who made decisive and groundbreaking contributions to avian taxonomy, evolution and population genetics. Widely credited as the world’s greatest evolutionary biologist in history, Mayr was fondly called the “Darwin of the 20th century”. Born in Kempten, Germany on July 5, 1904 to Dr. Otto Mayr and Helen Pusinelli, Ernst Mayr showed an early interest in ornithology. His father, a law practitioner loved nature and he would take his children on nature trips to enjoy the outdoors. Ernst’s father died when he was just 12 years old and the family moved to Dresden. Ernst studied at the Staatsgymnasium in Dresden and he joined the newly established Saxony Ornithologists’ Association in 1922. At the association he met Rudolf Zimmermann, a prominent ornithologist who became his ornithological teacher. After passing his school exams, Mayr attended the University of Greifswald in 1923, initially studying medicine. Mayr studied birds around the university countryside and he exchanged correspondence with school friend, Erwin Stresemann who was already a leading ornithologist. In 1925 Stresemann encouraged Mayr to switch his studies to biology and to develop his passion for ornithology into a career. Mayr acquired his doctorate in ornithology from the University of Berlin in 1926; he was only 21 years old. Mayer then accepted a position at the Berlin Museum. In 1927 at the International Zoological Congress, Mayr was invited by naturalist Walter Rothschild to lead an expedition to New Guinea and the Solomon Islands. Mayr was fascinated by the variations among the animals and plants caused by geographic effects he found there. These finding gave Mayr thought for his evolutionary theory which he would publish later in 1942. During the expeditions, Mayr also collected several thousand bird skins, named many new bird species and named 38 new orchid species. His book “Birds of the Southwest Pacific” was published later in 1945. Mayer returned from his travels in 1930 and he joined the American Museum of Natural History, New York as a curator in 1932. There, he wrote over 100 journal articles on the subject of bird taxonomy. In 1935 Mayr married Margarete Simon and they had two daughters. He published his famous book “Systematics and the Origin of Species” in 1942, which heavily contributed to population genetics and the evolutionary synthesis theory. Evolutionary synthesis relies on a combination of gene mutations, variation (recombination), heredity, natural selection and isolation to generate new species. 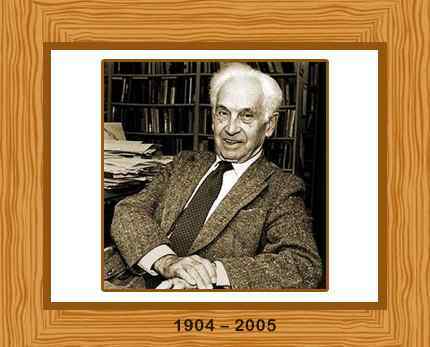 Ernst Mayr approached the concept of species by saying that a species is not merely a group of morphologically closer individuals, but a group that breeds only amongst themselves, excluding all others. The theory of peripatric speciation by Mayr is considered a major mode of speciation in ornithology. In 1953 Mayr became Alexander Agassiz Professor of Zoology at Harvard University, retiring in 1979 as professor emeritus. From 1961 to 1970 he also served as director of the university’s Museum of Comparative Zoology. During his lifetime, he named some 25 new bird species and 410 subspecies. He died in Bedford, Massachusetts on February 3, 2005. He was 100 years old.